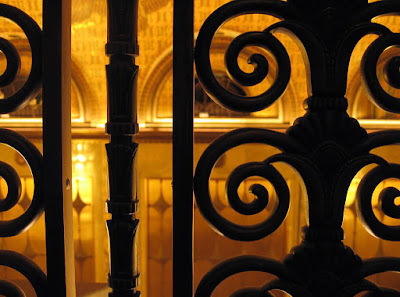 I snooped around the Fisher Building back in 2004 when I was on my little crusade to access rooftops of non-abandoned skyscrapers, but I didn't get very far with it. 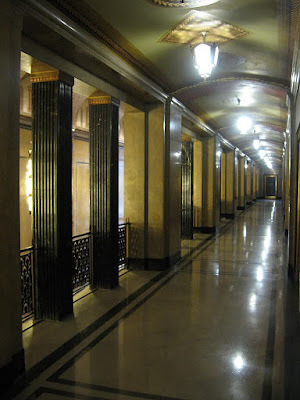 So recently I went on the Pure Detroit Tour For Suburban Baby Boomers to get pictures from the Fisher's upper floors—gasp!—Nailhed, the supposed great and exalted urbex0r ninja, forced to step out of the shadows of Gotham and ride in an elevator with soccer moms...?! Sue me. We all need a day off sometimes, even if it makes my website's stock slide a little. And I'm still in the midst of renovating my house, so nailhed.com is going to have to endure a little "light reading" for awhile. When they first started doing these tours I think they went to the 26th floor or something (which would be two from the top), then it was like the 22nd, and now if I recall correctly it is the 19th. Not sure what's going on with that, but there is still a lot to be said for the view from the Fisher Building's 19th floor, as you will soon see. Designated a National Historic Landmark, and often called "Detroit's largest art object," the Fisher Building is certainly one of the most eye-catching structures in the Motor City. It just seems to have a magnetism about it that makes one want to look at it. 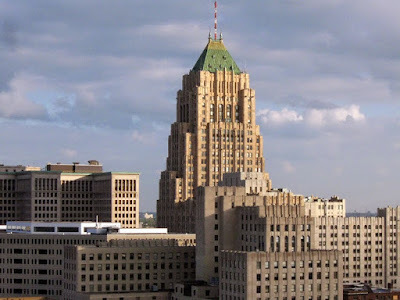 Whenever it is visible on the city skyline it draws the eye, resembling a sort of far-off beacon, away from downtown; a slick, art-deco sentinel embodying modernity, human achievement, and civic triumph, always appearing to be at the center of whatever it is that you happen to want to be a part of. In fact, I'm sipping an adult beverage and gazing at it through my back bedroom window right now as I type this. Since I spent a few years living in the shadow of the Fisher Building, and even though I've been inside it millions of times already, I figured we could walk over there one day and go try the tour. 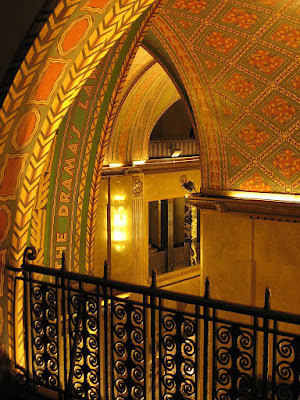 But first, a couple photos from the lobby, for those of you who might not have ever had the pleasure of seeing the inside. By the way, the lobby / concourse is open to the public during normal business hours; you can stop in and see it whenever you want. There are little shops, and cafes. 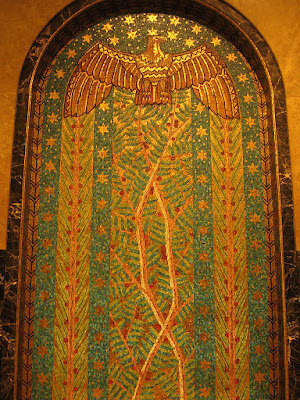 It was designed by legendary Detroit factory architect Albert Kahn and funded by the Fisher Brothers (of the Fisher Body Co.), who you should recall made their fortune by becoming the auto body suppliers for General Motors, and who made year-round automobile travel possible by mass producing the first fully-enclosed auto body. 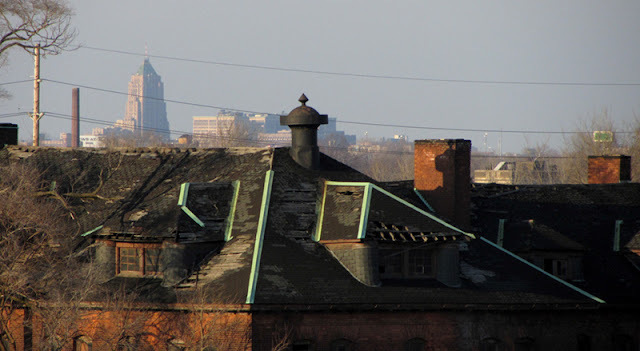 You may recall I have already written extensively about their business in my posts exploring the Fisher Body Plant #21 and Fisher Body Plant #10. 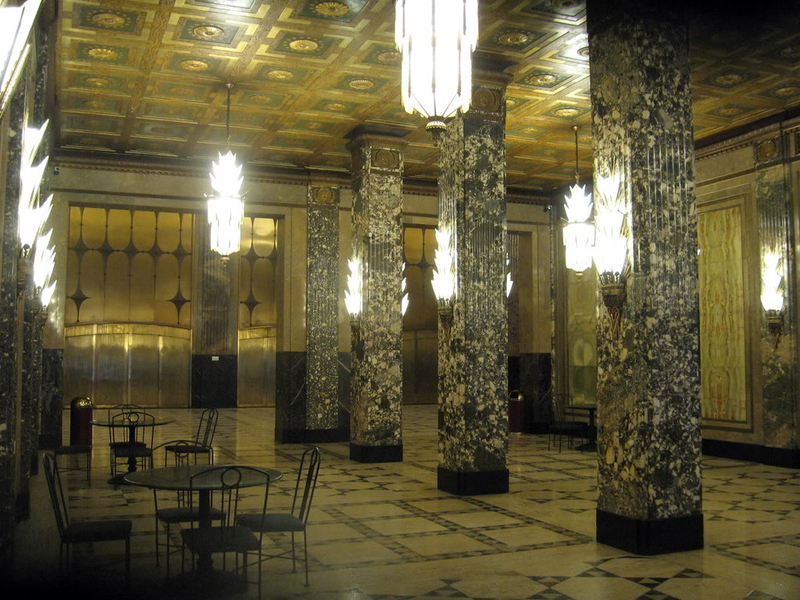 The building opened in 1928, and was not only a landmark of commerce, but it was designed to be a philanthropic "gift" or legacy to the people of Detroit, who would presumably benefit from having such a handsome architectural masterpiece in their city. 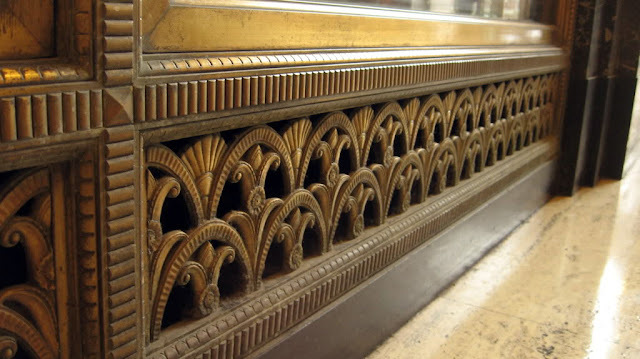 They chose the best location, the best materials, the most talented sculptors, modelers, decorators, and craftsmen for the project, and they hired the best architect to bring it all together—Albert Kahn. 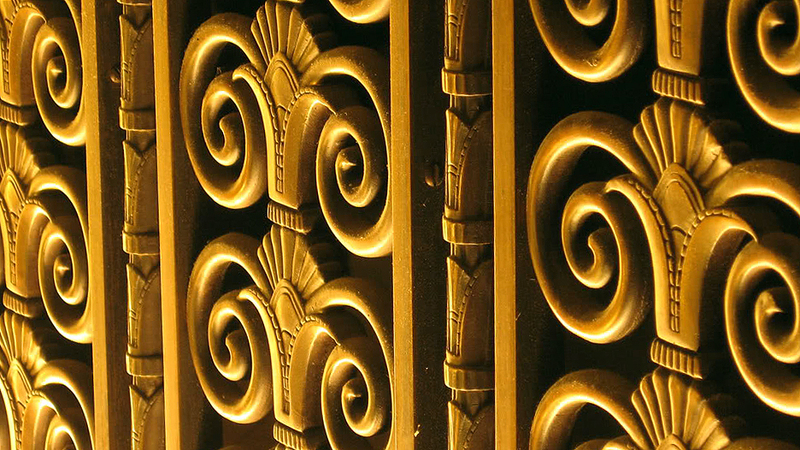 It cost the Fishers $9 million back then to build this temple of Art Deco, since they told Kahn that money was no object, and not to hold back on anything. 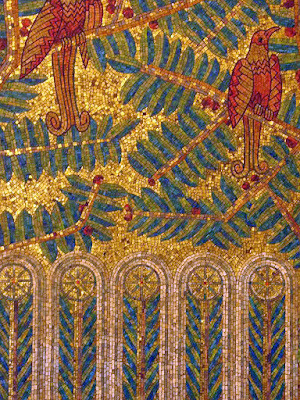 Under that great architect's guiding hand local Cranbrook Institute artists worked alongside itinerate European artisans to produce a true masterpiece. Much better than the failing Trump Tower—tremendous, okay? 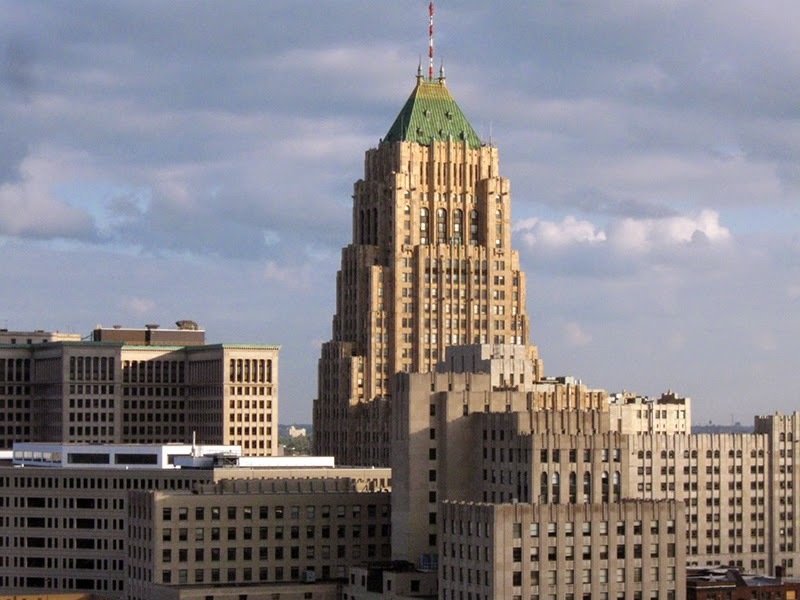 Kahn's original plan was to make the building much larger, with three towers connected by a central concourse. The central tower was to be no less than 60 stories tall, while the two flanking towers would be 28 stories, and the building's footprint would have stretched all the way to 3rd Avenue. As you know they only ended up building this one tower at 2nd Avenue, because the Great Depression just so happened to put a sudden damper on the Fisher Brothers' grandiose plans. 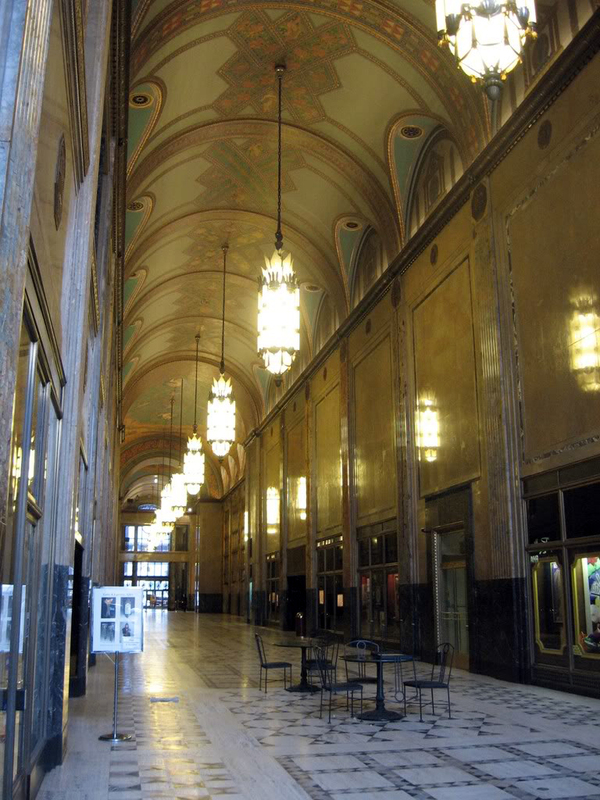 Had it been completed as envisioned, it would have been the largest commercial building in the world—a title that the General Motors Building across the street claimed runner-up to a few years earlier. ...The streaks on the ceiling in that photo indicate that there was water damage coming from somewhere at one point. 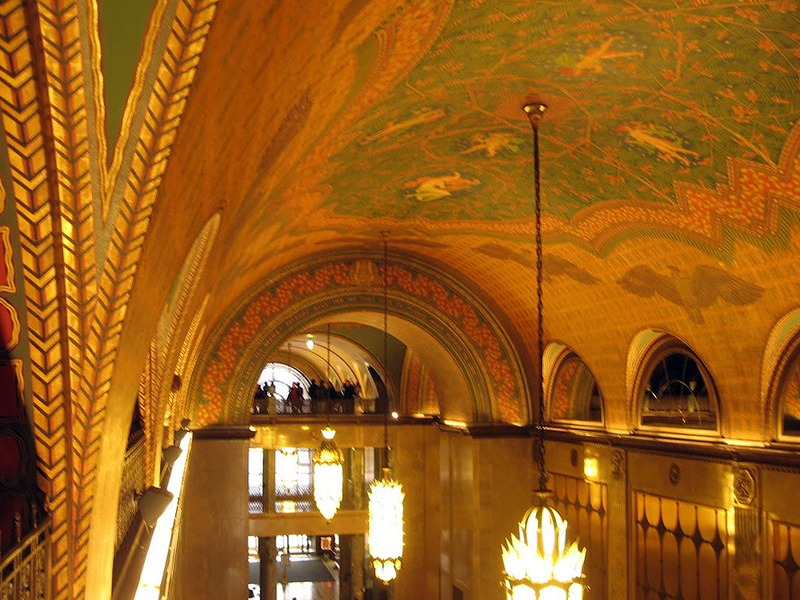 The Fisher Building has needed restoration work for a long time—but hey, welcome to Detroit. Thankfully it is finally getting some attention. 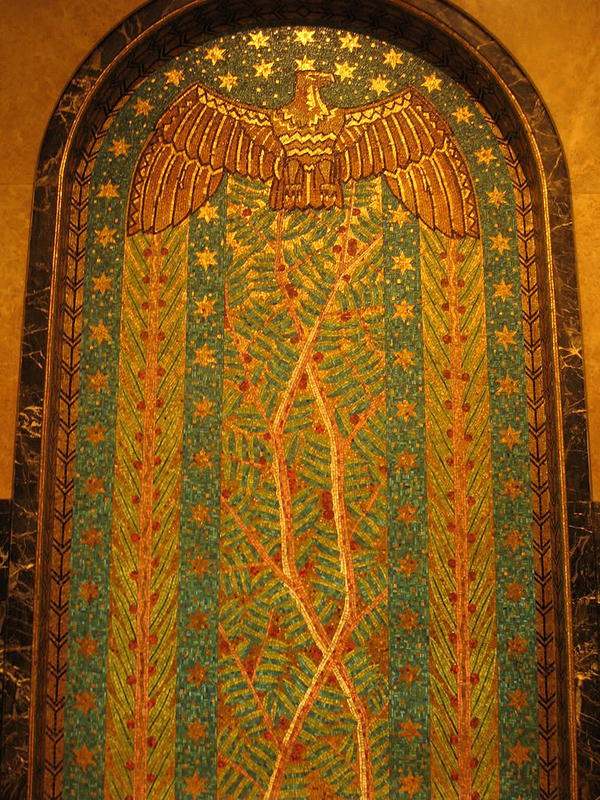 The Fisher Building's sleek exterior design was also modeled closely after Michigan architect Eliel Saarinen's contemporary "Tribune Tower" drawing, which at the time was considered *the* hottest new concept in designing modern skyscrapers. 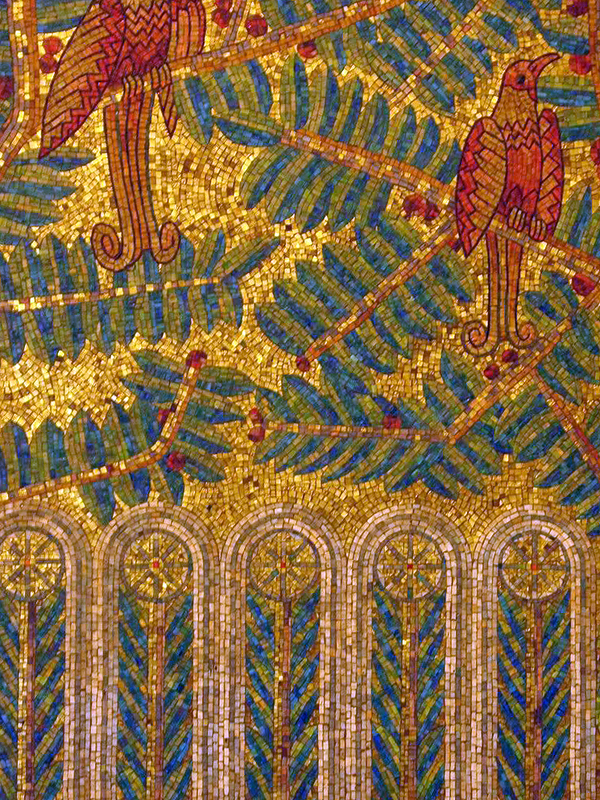 When the final tally was complete, 25% of the construction cost was spent on art work and luxury materials such as goldleaf, bronze, and 40 types of exotic marble quarried in Africa, Italy, and several places in the U.S.
And since it was built by auto industry barons, what could be more fitting than to add an attached parking garage so as to enable its tenants and visitors to come to work, frequent the many shops, eateries, and business offices, or even catch a show at the Fisher Theater without ever having to go outside? In that sense it presaged the suburban mall concept of putting everything under one giant roof, out away from the traditional downtown commercial district. 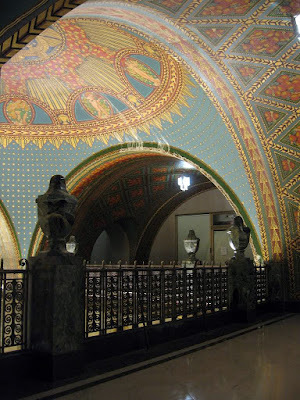 There was even a day-care center for the white collar executives to drop their kids off, and two pedestrian tunnels connecting the building to both the General Motors Headquarters, and the Albert Kahn Building across the street, further affirming that no American should ever have to go outside. The Fisher Building is also home to the studios of AM760 WJR, one of the oldest and most powerful radio stations in the United States. At night it can be heard throughout most of the Midwest, and eastern North America. 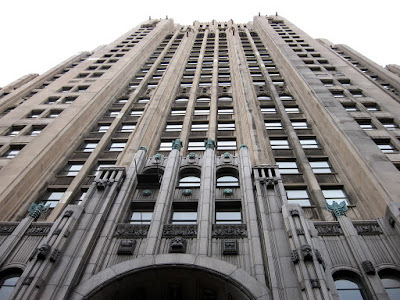 Just as the world's first commercial radio station, WWJ, was the offspring of the Detroit News, so too was WJR the offspring of its rival, the Detroit Free Press (WWJ began broadcasting in 1920, and WJR began two years later). WJR did not start out in the Fisher Building however, it began broadcasting from the Detroit Free Press Building on Lafayette downtown, and then moved to the top of the Book-Cadillac Hotel in 1925. 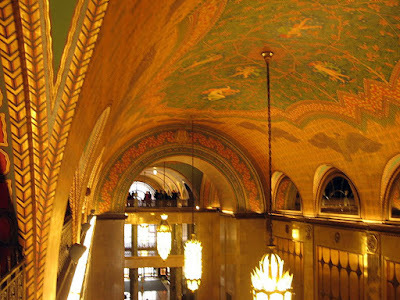 In 1928 the station moved here and began using the slogan, “Broadcasting from the Golden Tower of the Fisher Building," and by 1935 obtained FCC permission to broadcast at "50,000 Watts of Power," which is where they achieved their huge signal radius, soon giving birth to the nickname "The Great Voice of the Great Lakes." WJR is probably best known for its long-held broadcast rights to Detroit Tigers baseball games, and the voice of legendary sports commentator Ernie Harwell. 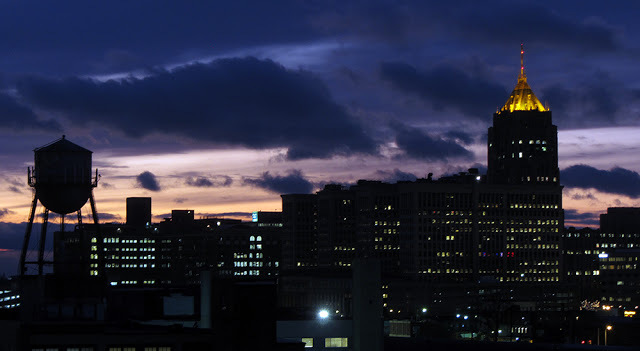 Today's programming schedule is dominated by nationally-syndicated right wing conservative talk shows, but WJR is also known as the flagship station of Detroit radio personality Mitch Albom. You may recall that I wrote recently about Spikehorn Meyers, the "bear man of Michigan," who kept bears as pets and ran a petting zoo up in Clare County. He was pretty famous back in the 1950s, and according to one article he came here to the Fisher Building with his bears to do an on-air interview at WJR Studios. Well he was only supposed to bring one bear to the interview and people were a little freaked out, especially when the one named Bruno escaped. 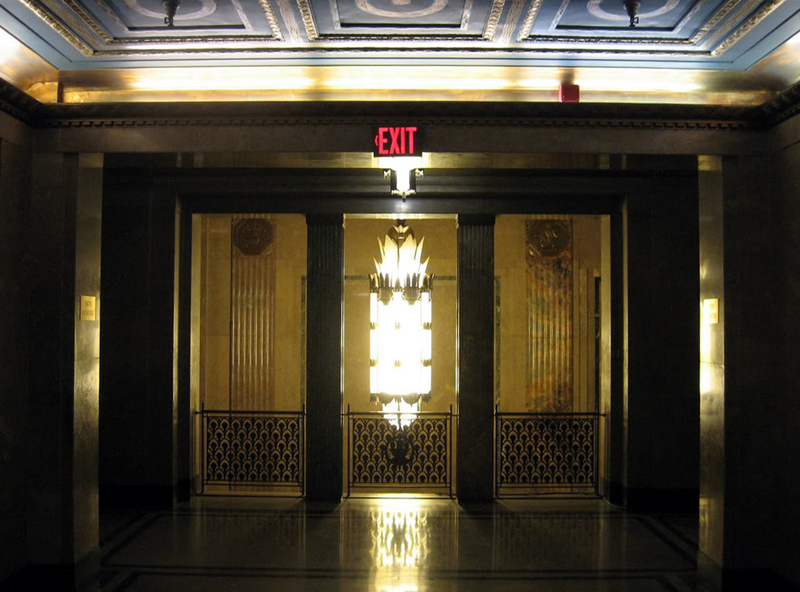 Apparently he got into an elevator and ended up on the floor above the studio, causing a bit of a panic in the building, which might've looked something like this. Finally—up in the tower...the real reason for this post. This is a typical elevator lobby on one of the upper floors. 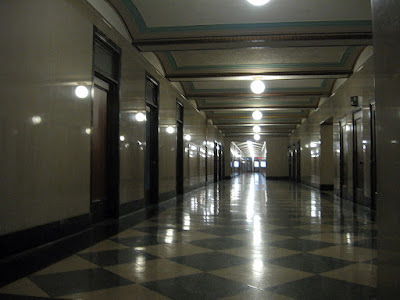 Unless you have a key to one of the offices, this is generally as far as you can get just wandering around on your own; there aren't any windows in the public areas. I wouldn't mind having a writing desk here in this corner... 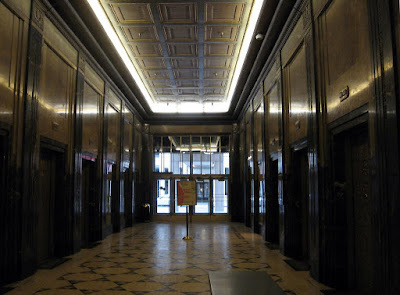 In fact, why not have a few writing desks sprinkled in various tall buildings across the city, where I can pop in on a whim when the feeling strikes me? Perhaps a little mini-bar as well? Stocked with fine cognac? 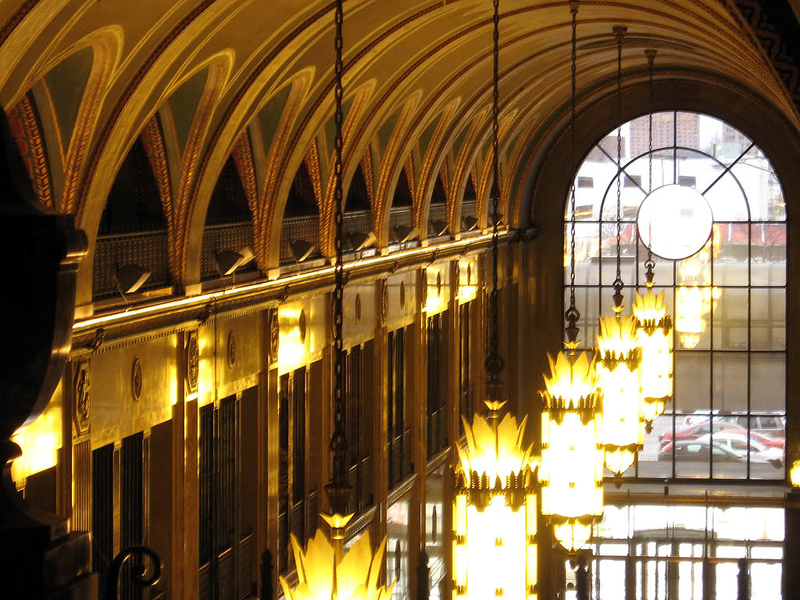 It was originally called the "Durant Building," named after the ill-fated founder of General Motors. 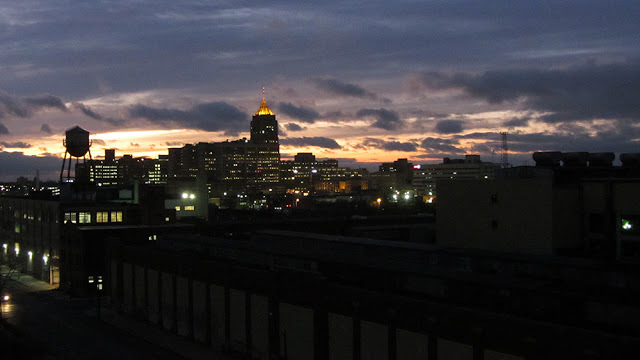 The tall building on the right in the next photo is the Albert Kahn Building (originally named the New Center Building). 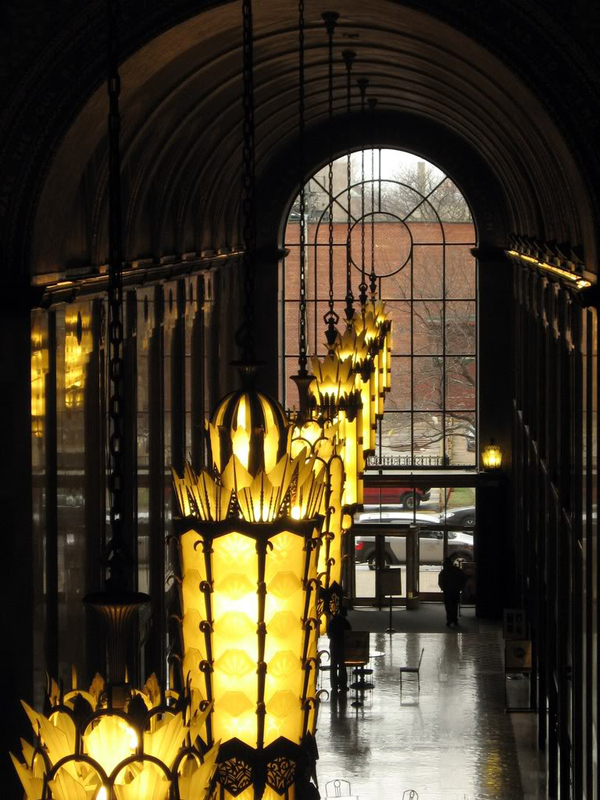 It has long been the headquarters of the Albert Kahn Associates architectural firm, and it is one of my other favorite buildings in the city. 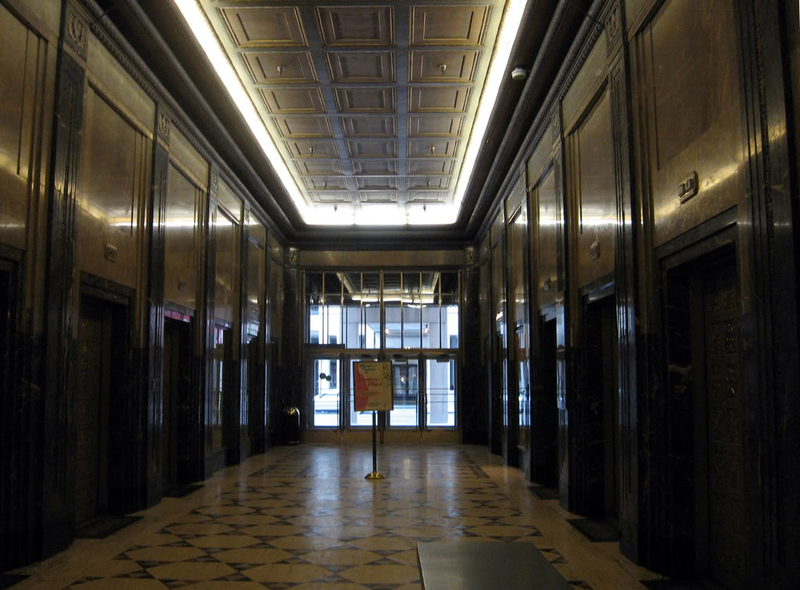 According to a Free Press article, the New Center Building was built as sort of a "consolation prize" when the Depression caused the Fisher brothers' plans for their three-towered 60-story Fisher Building to be abbreviated. They and Albert Kahn went forward with the New Center Building project in 1930 "to help ease the effects of the Depression by putting Detroiters to work," and as an expression of the Fisher brothers' belief that despite the minor setback of the Great Depression Detroit would continue to infinitely expand and flourish. And here are some of the aforementioned soccer moms—hey wait, I know those people... Yes, even the great masked explorer has family Sunday-Fundays once in awhile. 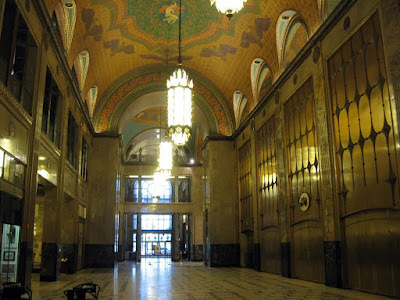 The Fisher Building, General Motors Building, and Argonaut Building were all designed by Albert Kahn, and for decades formed the nucleus of the world's largest corporation during the height of Detroit's power. Photo's blurry because I was gagging myself with a spoon. 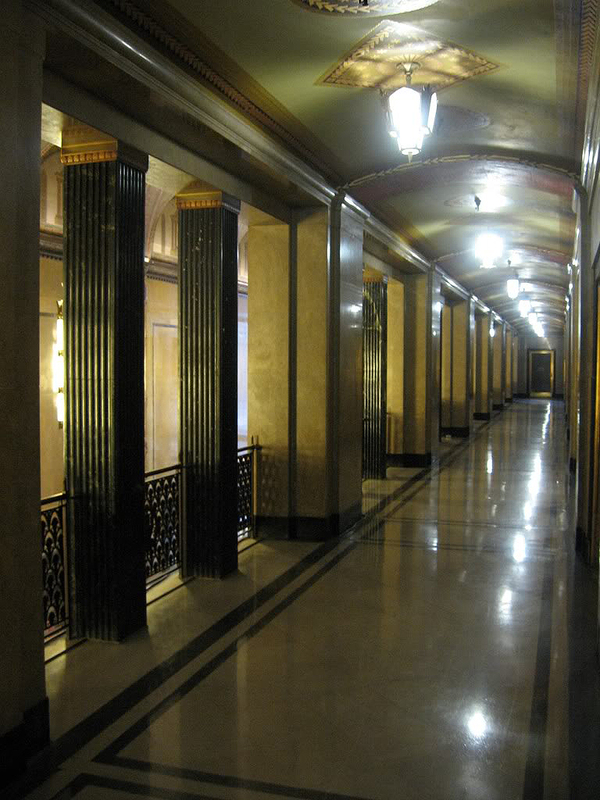 The building remained in the Fisher family until 1974, when it was sold to a real-estate firm by the three remaining Fisher Brothers. It recently was sold again (along with the Albert Kahn Building) for a paltry $12.2 Million. Argonaut Building contained a lot of what moved to the Tech Center in Warren in 1950s . . . design studios, prototype building, etc.